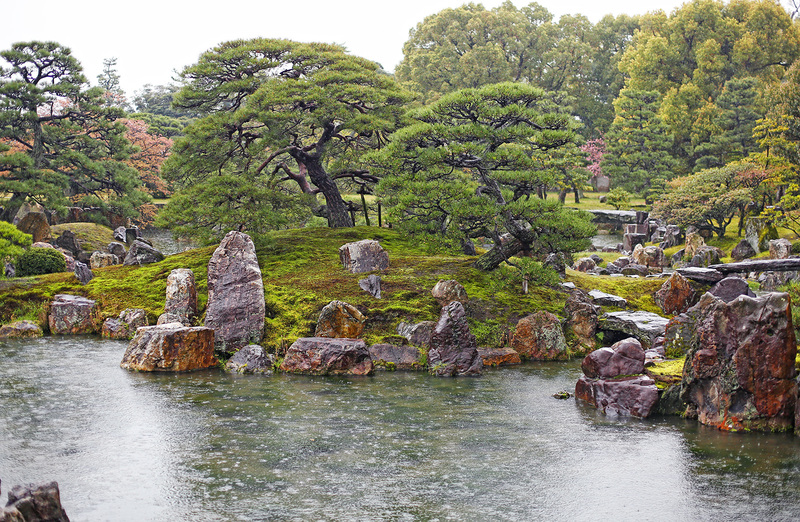 The Nijo-jo or Nijo Castle is one of the few remaining castles in Japan that showcases traditional palace architecture of Japan’s feudal era. 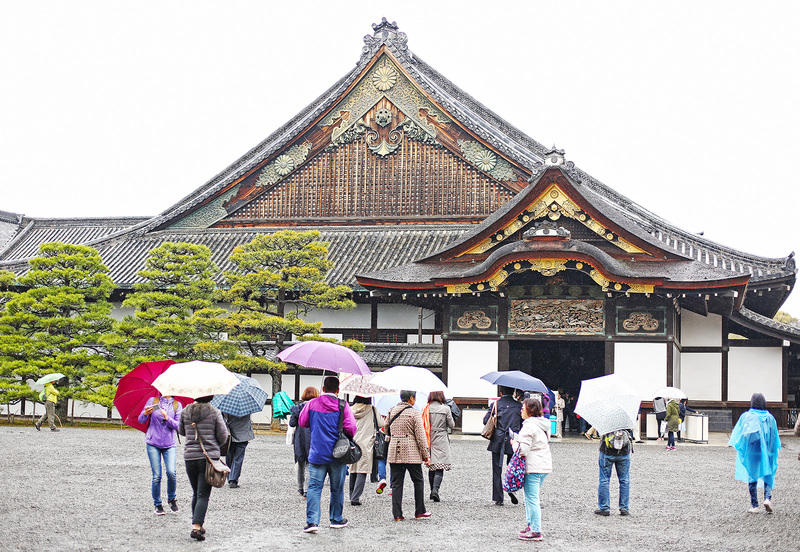 It’s definitely not as in-your-face flamboyant as European castles and possesses a more subtle kind of grandeur, but nevertheless, still worth a visit. The biggest difference I noticed between the two is how clearly the Japanese valued their defense mechanisms when it comes to building a castle. You see. when you tour around most European castles, all you really notice are the pretty rooms, paintings and decor. 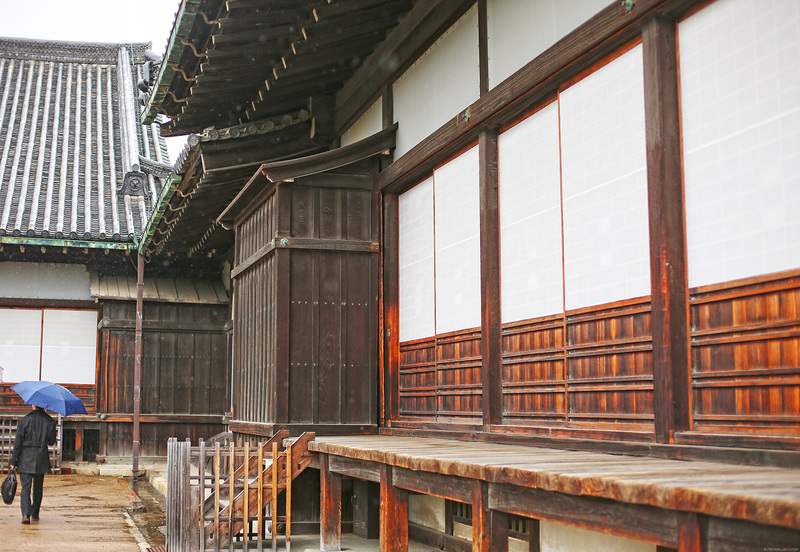 Here at Nijo Castle, it’s easy to see how a lot of its features were built for the purpose of protecting the castle. 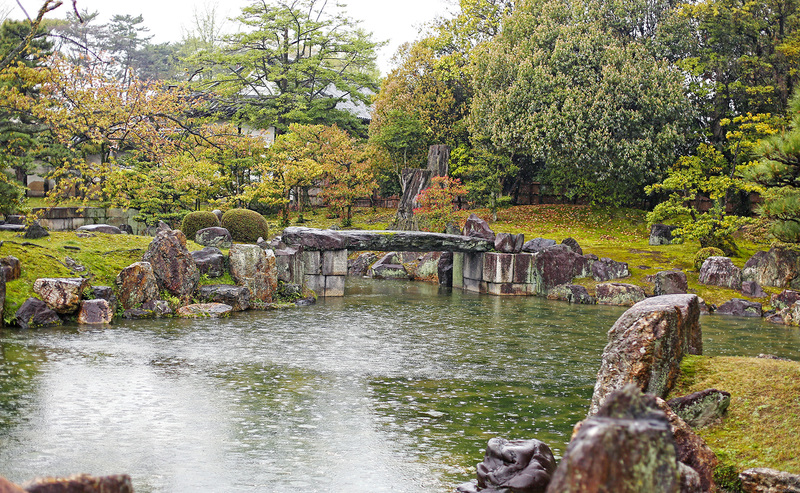 Huge stone walls surrounded by deep moats is the first line of defense and a series of gates follow as you venture closer to the center of the castle grounds. 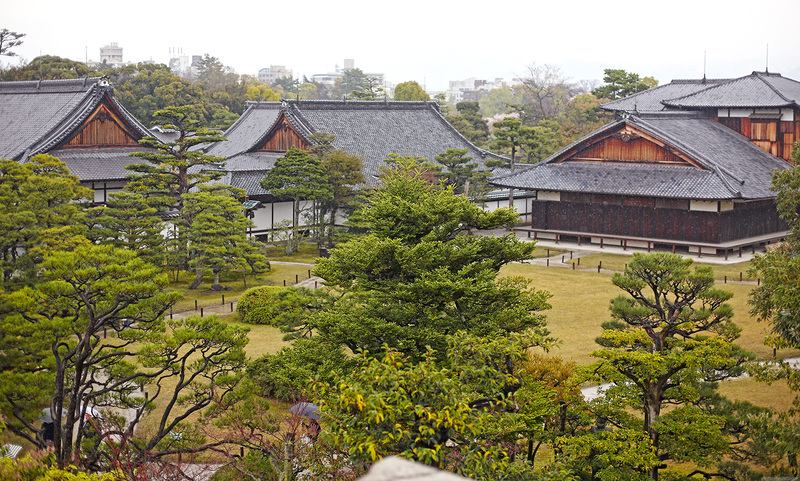 The main attraction at Nijo Castle is the Ninomaru Palace. 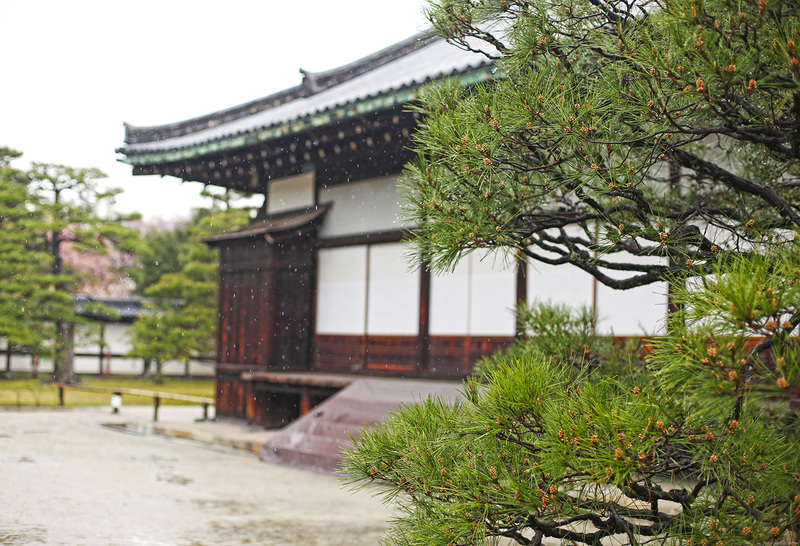 It served as the residence and office of the shogun whenever he’s in Kyoto. 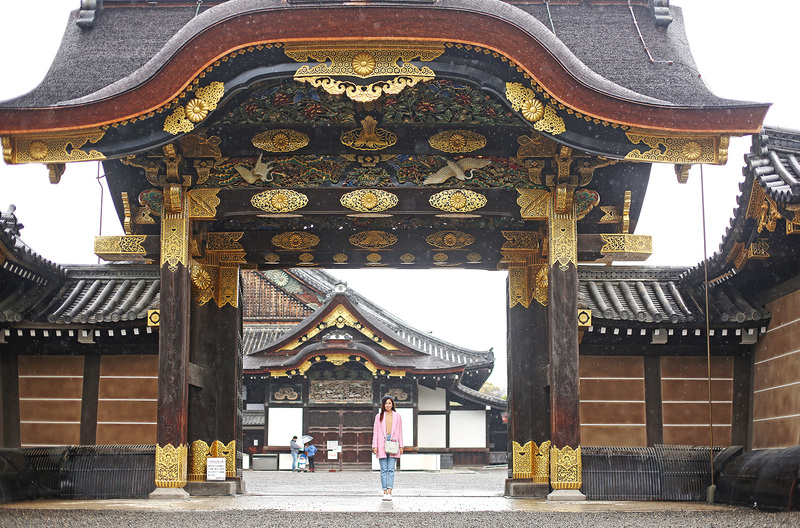 Visitors are allowed to enter the palace but you’ll have to leave your shoes out. 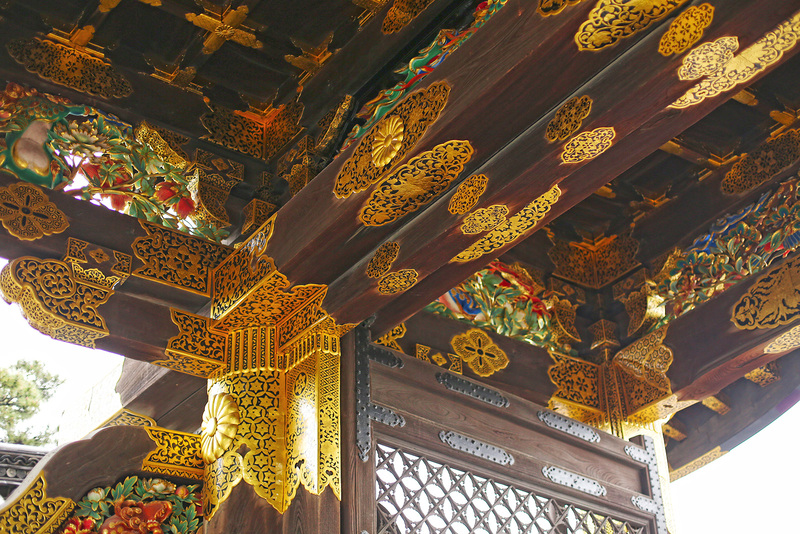 Once inside, you’ll see all the palace rooms are covered with tatami mat and feature beautifully decorated ceilings and painted sliding doors and panels. These rooms are mostly waiting and audience rooms. 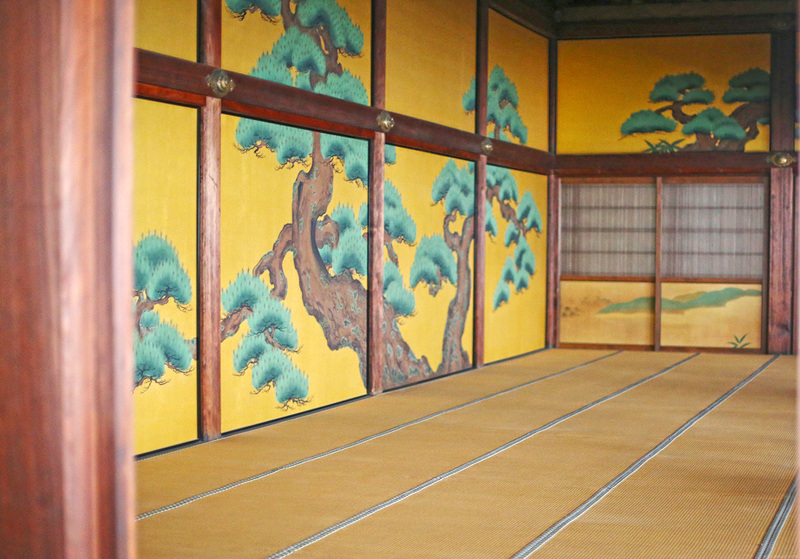 A few are offices and living chambers, the latter of which were only accessible to the shogun and his female attendants. 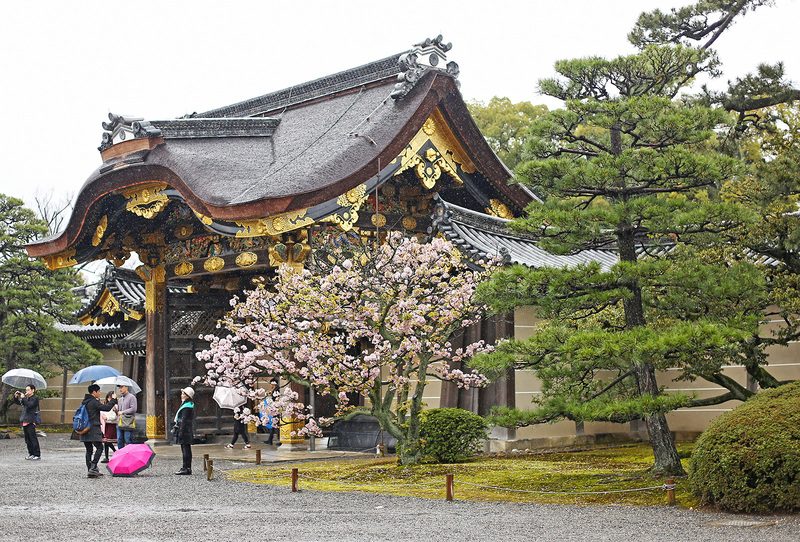 As you walk along the corridors that connect the rooms and structures of the palace, you’ll also notice that every step you take makes a squeaking sound. At first I thought it was because the floors were old but apparently, they were really made to squeak to alert officials of intruders’ presence, which is why they’re called nightingale floors. How clever! 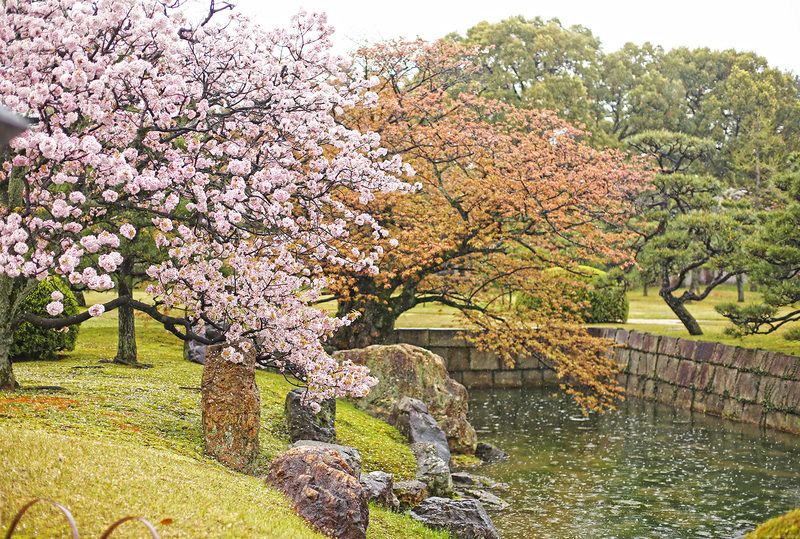 After touring around Ninomaru Palace, here comes my favorite part–the gardens. 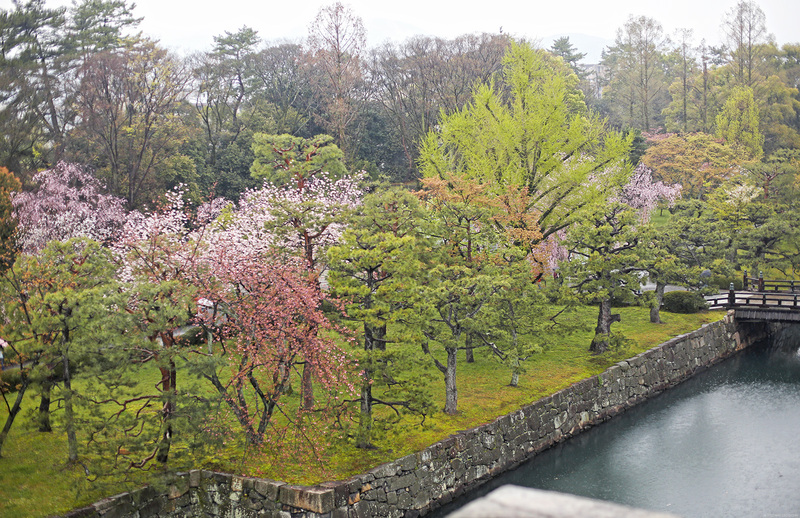 It was actually raining when we visited Nijo Castle but as you can see, no gloomy weather can dampen the beauty of the cherry, plum, maple and gingko trees that filled the gardens. What a way to end our tour! Camille!!! Are those Dior earrings? Where did you get them? and for how much? Hi Camille :) I love your photoes it’s very nice :) And I really love your coat and your shoes, oh and where could you find october 1? definitely should bookmark when i get chance to visit Japan again! 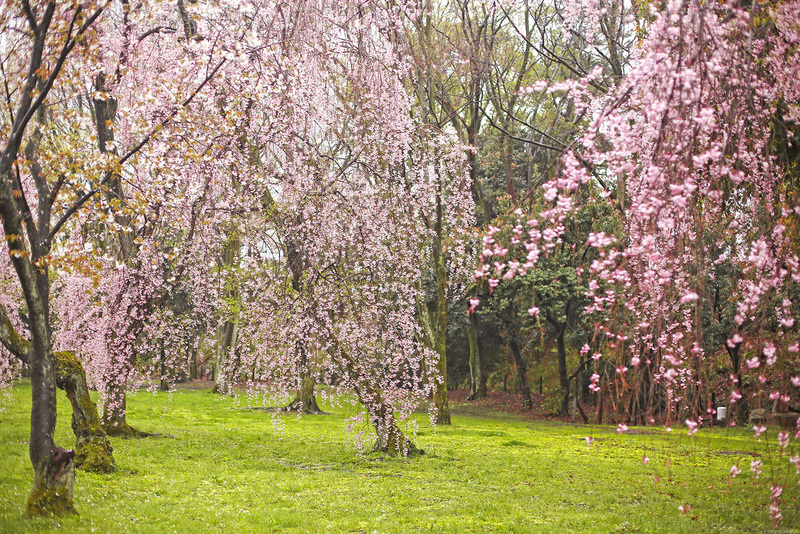 ps,love your pink coat ! Wow. You look so beautiful. Love the color mix of your oufit. Very pretty! 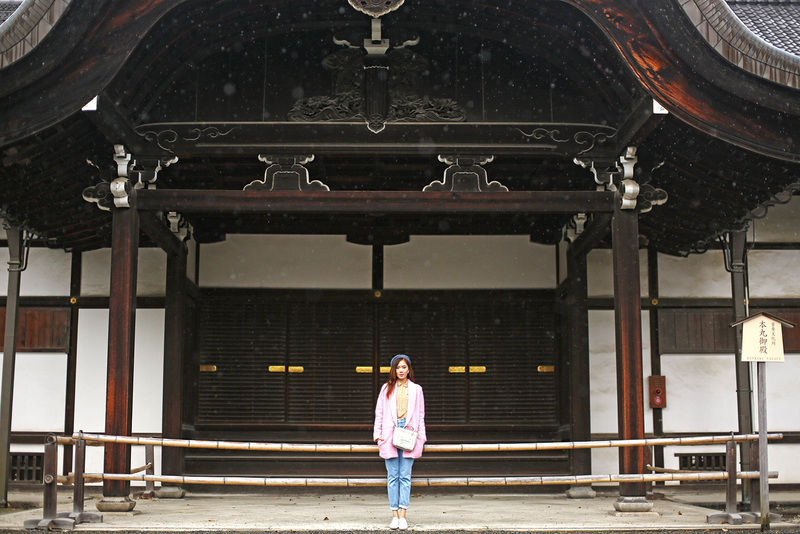 These travel and style diaries from Japan are simply gifts that keep on giving! Aaaah I am in love with that pink coat Cams. Somehow, I wish to travel somewhere cold just so I could wear one. Haha! Thanks Anne! :) I always feel that way whenever I get a new coat! The place looks so cool.